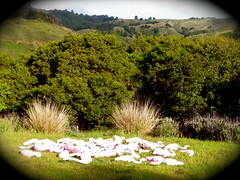 The elusive wild flamingos of Big Sur (Phoenicopterus surianus) are rarely seen in their natural habitat. This photo is one of the few known sightings clearly illustrating the unusual habit of flamingo day-sleeping, otherwise known as Avian Diurnal Narcolepsy. While not completely understood by scientist studying the phenomenon, multiple theories have been put forth. Avian Diurnal Narcolepsy (ADN) is sometimes seen in individual birds, but as far as what has been observed in the field, Big Sur flamingos may be the only bird species to demonstrate flock ADN. The leading theory for the cause of this phenomenon is linked to petrol-chemical polymer structures in the Big Sur flock seen here. This photo was taken using a remote motionless sensor cam at one of the few closely guarded locations where the birds can be found. The story about these elusive birds is unbelievable. Wishing you a happy first of April!